This year, the World Diabetes Day is marked by a multitude of manifestations aimed at education, and raising awareness of diabetes. A special emphasis is placed on children, as the most endangered category of diabetics. 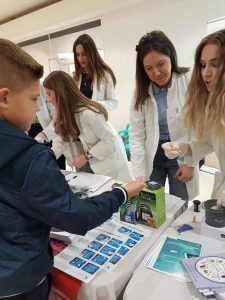 Pharma Maac, in cooperation with several associations of diabetics from Bosnia and Herzegovina, conducted free sugar measurements as well as education in several cities of Bosnia and Herzegovina. Premium European brand Wellion arrived to Prnjavor, Zvornik, Mostar, Tuzla, Sarajevo. Pharma Maac will do everything in the future to be at the service of all people with diabetes in BiH, especially the most vulnerable – children.